Today was the annual Local Marketing, Inc. holiday party, and while we normally take the team out for a nice dinner, this year, we changed it up. We ordered food in from a local caterer, Figs and Honey. We decided on a mix of heavy hors d'oeuvres, and some of the eats included crab stuffed mushrooms (my favorite), deviled eggs, stuffed potatoes and much more. Everyone brought a toy to donate to Toys for Tots. We had our annual white elephant gift exchange. I ended up with a camel shaped candle holder. It will make an interesting addition to my office. 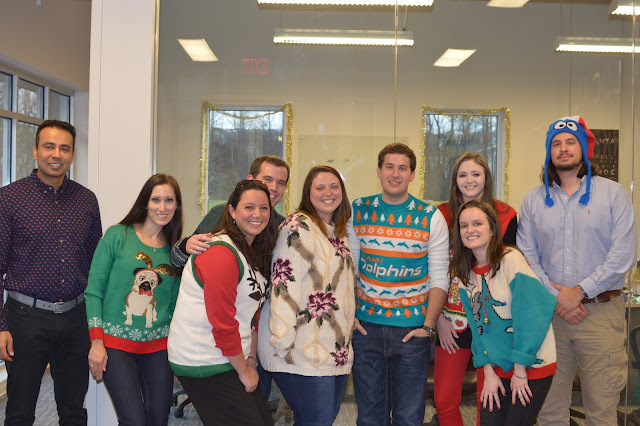 For the first time, we held an ugly Christmas sweater contest. While I did not win, I did have fun wearing this sparkly pug Christmas sweater from the Blizzard Bay brand, which you can still buy on Amazon! As you can see, not everyone participated in the contest, but we had a decent turnout. Jordan, in the middle with the Dolphins Christmas sweater, was the clear winner! We had 17 people total at our holiday party, the highest number we've ever had. I looked around during the party and felt so proud. Puneet and I have really built an amazing company, and I continue to feel happy every day I come to work. It's not always easy, but it is definitely rewarding.